Researchers from the Federation of State Medical Boards and University of California, San Francisco recently collaborated with the American Board of Internal Medicine (ABIM) to examine career paths of internal medicine residents and, last month, Academic Medicine featured our findings in the research report: “Specialty Certification Status, Performance Ratings, and Disciplinary Actions of Internal Medicine Residents”. The results indicate that non-certified physicians who then go into practice had five times more frequent—and often more serious—disciplinary actions than the ABIM Board Certified group. Individual physicians who achieve board certification from ABIM are likely to have fewer disciplinary issues throughout their careers. 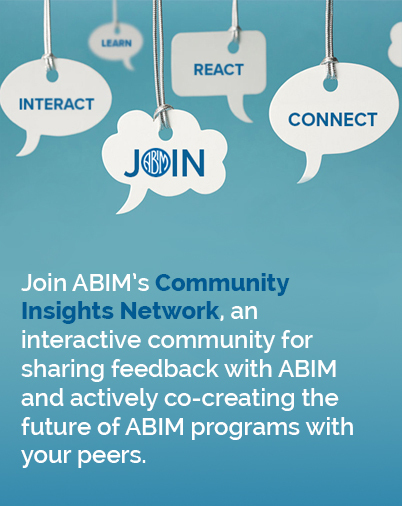 Ninety-five percent of physicians who complete at least a year of internal medicine training successfully achieve board certification through ABIM. The ABIM Board Certified group had higher average ratings from program directors than non-certified physicians. Internal medicine resident attrition minimally impacts physician supply. These findings reinforce that most physicians who achieve initial certification—a proud and important moment in a physician’s career—have the knowledge and skills necessary to go into practice and, through time, have higher performance indicators than their non-certified peers. To learn more about the study, read our recent news release. It is important for ABIM and others in the field to continue to study physician assessment and the role of both certification and Maintenance of Certification (MOC). Read more research on these topics at ABIM.org and find out about a study ABIM recently launched to examine ways ABIM Board Certified physicians might have access to online resources during a portion of the MOC assessment.